Padawan learner Ahoska and Jedi mentor Anakin Skywalker find themselves in a perilous situation in the upcoming "Star Wars: The Clone Wars." I suppose you could tell the combined stories of Winston Churchill, Franklin Delano Roosevelt, Adolf Hitler, Benito Mussolini, Hideki Tojo and Josef Stalin with only a passing mention of World War II, but it would be pretty tough. And yet, that's essentially what happened to the "Star Wars" mega-epic as originally envisioned by George Lucas. 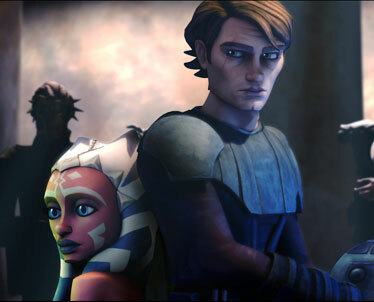 The universe-altering clash known as the "Clone Wars" occurs between "Episode II -- Attack of the Clones" and "Episode III -- Revenge of the Sith," a three-year period unaccounted for, and yet, in that short time, ambitious, reckless young Anakin Skywalker has become darker, more self-centered, moody and angry. The problem, apparently, is that the story of a war is one of strategy, not of character development. Armies battle, politicians scheme, diplomats maneuver, hills are taken and planets seized, victories scored and defeats suffered, and none of it matters unless it affects the story arc of the primary characters. By nature, war is episodic. Too much to summarize in a film or two. Which drops us right into "The Clone Wars," a diversion in the "Star Wars" story line, but a mighty one. Creator George Lucas has committed to 100 or so episodes of a televised series -- albeit in widescreen and hi-def -- and the whole thing is kicked off with a feature film that's essentially a pumped-up TV episode in the way it feels, although not in the way it looks. This is a new kind of mass storytelling, and Lucas is stepping into virgin territory here. Luckily, he has a fat wallet to cover expenses. It's a fascinating experiment, and "Clone Wars" rates highly not just for what it is, but for the bold chance it represents. Although much will be made of the animated character of the film, the strangeness wears off almost immediately. "Clone Wars" is even kind of anti-animation, with its lush, detailed and beautifully rendered worlds. It is gorgeous to look at. The animators don't even try to make the characters photo-realistic; instead, they're like hand-painted toys that have come to life -- you can read into that any amount of psychological cleverness! -- that function like avatars in a computer game. It's either off-putting, or you surrender to the style completely. Surrender is easy, as the film itself is exciting and cheeky, more in the style of the classic "Episode IV -- A New Hope" than the three oft-dreary modern "Star Wars" films. In this outing, we begin to understand why Anakin becomes a hero of the Republic. He's his own counsel, beginning to graduate from the mentorship of Obi-Wan Kenobi, to the point where he's assigned his own student, Ahoska Tano, and you can absolutely assume a bantering relationship in which each grows more mature over the story arc, because Mr. Lucas, he doesn't mess with classic forms of mythological storytelling. Ahoska is also short, young, female and sort of ethnic, the clear product of committee demographics. Their mission is to rescue the kidnapped offspring of Jabba the Hutt, which they do with hairbreadth aplomb. The end of the film is rather sudden, but then, it simply stops rather than finishes, because the televised edition starts in October, and this is essentially the first episode. The dramatic potentiality of the animated series is rich, as this period of politics in a galaxy far, far away is gray and ethically scrambled. Remember that Anakin and Kenobi and other Jedi are in service to the Galactic Republic, and they're battling the "Confederacy of Independent Systems," basically, tech-heads and free-traders. All is manipulated by politicians behind the scenes, and in the foreground, the battles are fought between high-tech and biotech systems. We're also goosed by the boding foreknowledge that the democratic Republic will become the dictatorial Empire, largely by scaring the populace, and that the Jedi will be betrayed in the process. Plenty to chew on, 'Bacca. Hope the TV series lives up to the promise of this feature episode.